Tokyo/Osaka, Japan (August 7, 2018) - Mitsui Fudosan Co., Ltd., and Mitsui Fudosan Residential Co., Ltd., leading global real estate companies headquartered in Tokyo, and Panasonic Homes Co., Ltd. announced today that they are planning the first project for Sanmatsu Development and Construction Co., Ltd., the first joint venture established in 2017 between Mitsui Fudosan Group and Panasonic Group to promote their built-for-sale housing businesses in Taiwan. 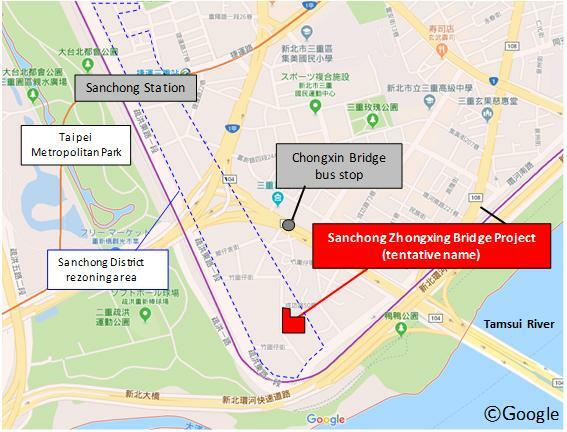 The planned project is tentatively named the Sanchong Zhongxing Bridge Project, and it is expected to pave the way for their continued growth in the housing sector in Taiwan going forward. Sanmatsu Development and Construction brings together the housing business expertise of both Mitsui Fudosan and Panasonic groups honed in Japan and overseas to offer high-quality, sophisticated living spaces that Japanese companies are so renowned for. The joint venture will offer Taiwanese customers a new lifestyle in light of actual living conditions, and contribute further to improving housing in Taiwan by striving to differentiate itself from local companies. 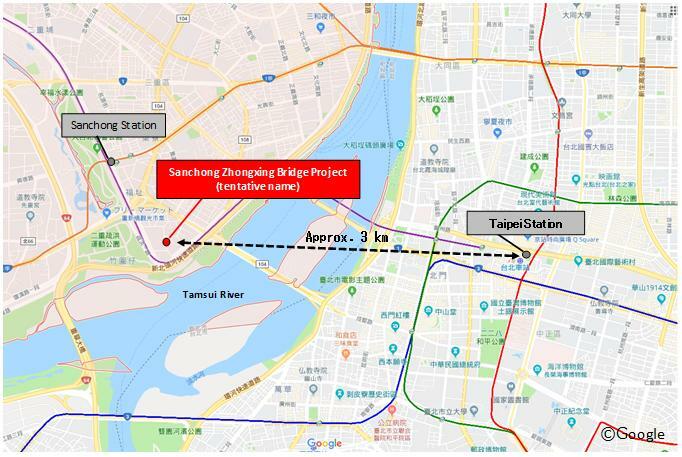 The planned site of the first project is situated in a rezoning district approximately 1.8 miles (3 km) from Taipei Station in the center of the city. The closest MRT station is Sanchong (approximately 5 minutes from Taipei Station), where there are strong prospects for future development given the planned redevelopment around the station. In addition to its close proximity to the city center and ample future potential, the site offers a living environment surrounded by greenery with the Tamsui River and Taipei Metropolitan Park only a short distance away. Moreover, the project plans to add originality and ingenuity unique to these industry-leading companies given their strong track record in Japan and overseas, including a Japanese-style color selection plan, periodic after-sales services, and the installation of Panasonic's smart condominium system. Sanmatsu Development and Construction Co., Ltd.
Mitsui Fudosan Taiwan Co., Ltd., Panasonic Homes Taiwan Co., Ltd.
Mitsui Fudosan Group's long-term management policy, Vision 2025, includes the aim to evolve into a global company, and dramatic growth overseas is expected in the future. Mitsui Fudosan has thus far expanded its operations to the US and the UK, as well as in the Asian region. 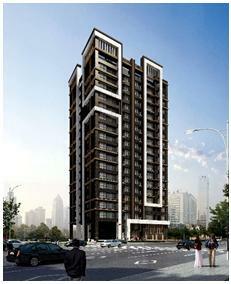 The Group is advancing its housing business in Singapore, Thailand, Malaysia, Indonesia, the Philippines, and China. In addition, Mitsui Fudosan is ramping up its commercial facility business with outlet malls in Kuala Lumpur and Taiwan, and LaLaport facilities in Shanghai, Kuala Lumpur and Taiwan in order to actively tap growing consumer demand and contribute to local economies, as well as aggressively expand its operations in the rapidly growing Asian market with the aim of quickly expanding earnings. In January 2016, Mitsui Fudosan Group opened Mitsui Outlet Park Linkou, the Group's first business in Taiwan. The Group will be opening Mitsui Outlet Park Taichung Port (tentative name), the Group's second outlet park facility in Taiwan, in 2018. The Group is currently developing business with the goals of opening Zhongxiao Xinsheng Hotel (tentative name), the Group's first hotel business in Taiwan, in 2020; Mitsui Shopping Park LaLaport Nangang (tentative name), the Group's first LaLaport facility in Taiwan, in 2021; and Zhongshan Zhongxiao Hotel (tentative name), the Group's second hotel business in Taiwan, in 2022. The Sanchong Zhongxing Bridge Project will be the Group's first housing business undertaking in Taiwan. In order to further expand business going forward, the Group established an investment base in the form of a local subsidiary (Mitsui Fudosan Taiwan Co., Ltd.) with the aim of stepping up operations throughout Taiwan in the commercial facility, hotel, and housing businesses, as well as in logistics facilities and multi-purpose facility developments. *About Mitsui Fudosan Taiwan Co., Ltd. Established in 2016 as a jointly-owned company between Mitsui Fudosan Co., Ltd. and Mitsui Fudosan Residential Co., Ltd.
Panasonic Homes Co., Ltd. was established in 1963 by the founder of Panasonic Corp., Konosuke Matsushita. For more than 50 years since then, the company has expanded its housing business in Japan and honed its technology and expertise in the building of homes. As of March 31, 2017, cumulative home sales had reached approximately 490,000. The company became a wholly-owned subsidiary of the Panasonic Corp. in October 2017 and changed its name from PanaHome to Panasonic Homes in April 2018. The company entered the Taiwan market in 2010, Malaysia in 2012, and Indonesia in 2017, and has expanded its housing business from detached homes to condominiums. It has also expanded its services from the interior business to construction and urban development businesses. Panasonic Corp. established Panasonic Taiwan Co., Ltd. in 1962, which currently has a total of 10 group companies, including Panasonic Homes Taiwan Co., Ltd.
Panasonic Homes Taiwan commenced operations in March 2010 with its interior business and then expanded into construction in October 2011. The company undertakes work for mainly condominiums, from building design and construction, through to interior finishing. There is currently strong demand for condominium construction in Taiwan and the company works on more than 10 projects over the course of the year. Sanmatsu Development and Construction joint venture signals a full-scale entry into the development business in Taiwan. Based on the concepts of "healthy," "comfortable," "safe," and "secure," the joint venture aims to provide Taiwanese customers with better housing through an integrated approach that extends from development right through to construction, interior, and after-sales services.